The success of biofortified staple crops depends on whether they are accepted and consumed by target populations. In the past 8 years, several studies were undertaken to understand consumers’ acceptance of foods made with biofortified staple crops. Consumer acceptance is measured in terms of their sensory evaluation and economic valuation of biofortified varieties vis-à-vis conventional ones. These studies apply expert sensory panel and hedonic trait analyses methods adopted from food sciences literature, as well as various preference elicitation methods (including experimental auctions, revealed choice experiments, and stated choice experiments) adopted from experimental economics literature. These studies also test the impact of various levers on consumers’ evaluation and valuation for biofortified foods. These levers include (i) nutrition information and the media through which such information is conveyed; (ii) the length and content of nutrition information; (iii) different branding options; (iv) the nature (national or international) of the branding/certification agency that is endorsing the biofortified staple food; and (v) the nature (national or international) of the agency that is delivering the biofortified staple food. 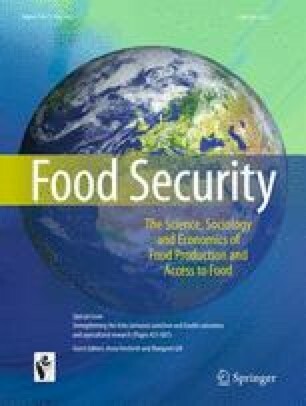 This paper brings together evidence on consumer acceptance of biofortified crops on 5 crops across 7 countries in Africa, Asia and Latin America. The results of these studies are expected to aid in the development of biofortified crops that consumers like, as well as in the development of appropriate marketing and consumer awareness or information campaigns to encourage the switch in consumption from traditional staples to biofortified ones. Special section series Strengthening the links between nutrition and health outcomes and agricultural research. Micronutrient malnutrition is known as “hidden hunger” because its symptoms have few visible warning signs. Caused by a lack of critical micronutrients such as vitamin A, iron and zinc, hidden hunger impairs the mental and physical development of children and adolescents thereby generating long-term effects on their livelihoods (Bryce et al. 2003; Alderman et al. 2006). Experts estimate that 2 billion people, mostly in rural areas of developing countries, suffer from one or more micronutrient deficiencies (FAO, IFAD and WFP 2012); women of child-bearing age and children are especially vulnerable because they have greater needs for micronutrients (Darnton-Hill et al. 2005). Hidden hunger is primarily caused by poor quality diets, with low ratios of calories derived from micronutrient-rich non-staple foods (vegetables, fruits and animal/fish products) relative to those from staple foods. A subset of those who suffer from hidden hunger have the additional challenge of meeting their daily requirements of energy. One promising strategy for fighting hidden hunger is biofortification, which improves the nutritional content of staple food crops by breeding varieties that are richer in three of the most limiting micronutrients (vitamin A, iron, and zinc) than conventional ones (Saltzman et al. 2013). Varieties of biofortified staple food crops are bred to display desirable agronomic attributes, such as high yields, and consumption properties that match or outperform those varieties farmers currently grow. Biofortification targets the rural poor, who produce and consume staple food crops in significant quantities, and who may not have access to other nutrition interventions such as fortification, which mainly target urban populations that consume processed food. Thus far, seven staple crops biofortified with one of the aforementioned three most critical micronutrients have been developed by using conventional breeding methods: vitamin A (orange) maize, vitamin A (yellow) cassava, vitamin A (orange) sweet potato, iron beans, iron pearl millet, zinc rice and zinc wheat. In the past few years, conventionally bred biofortified varieties of several of these crops have been released by the national release committees of several developing countries (e.g., vitamin A orange sweet potato (OSP) in Mozambique and Uganda, vitamin A yellow cassava in Nigeria, iron beans in Rwanda and vitamin A orange maize in Zambia), and further releases, as well as plans for delivery of the planting material of these varieties are underway (Saltzman et al. 2013). Existing evidence suggests that biofortification is an efficacious and cost-effective strategy for alleviating micronutrient deficiency in rural areas of several developing countries. Ex ante cost-effectiveness studies suggest that biofortification is likely to be a cost-effective public health intervention in many countries for several micronutrient-crop combinations (Stein et al. 2007, 2008; Meenakshi et al. 2010; de Steur et al. 2012). There is also considerable evidence of the efficacy of biofortification1 (biological impact under controlled conditions similar to clinical trials) as well as its effectiveness2 (biological impact under controlled pilot interventions). These effectiveness studies also reveal that biofortification is a cost-effective intervention: the most effective-least cost delivery model tested cost US$15–US$20 per DALY (Disability Adjusted Life Years) saved, which by World Bank standards is considered highly cost effective (World Bank 1993; HarvestPlus 2010). As evidence in favor of cost-effectiveness and nutrition impact of biofortified foods builds up, two questions arise: (1) will target consumers accept biofortified foods? and (2) what are the effective levers or mechanisms to maximize target consumers’ acceptance of biofortified foods? A series of interdisciplinary studies have been conducted to answer these questions, which integrate food science and economics approaches to assess consumer preferences for food made from biofortified varieties relative to those made from conventional varieties. In this paper we present the results of the consumer acceptance studies led by HarvestPlus, the global leader in biofortification (www.harvestplus.org). These consumer acceptance studies were conducted for various crops, including those with a visible nutrition trait (i.e., vitamin A enriched biofortified crops which change color from white/cream to yellow/orange due to the increased beta carotene content), such as OSP, vitamin A maize and vitamin A cassava, as well as those crops with an invisible nutrition trait (i.e., mineral, such as iron or zinc, enriched crops that do not change color with biofortification), such as iron pearl millet and iron beans. These studies were conducted with target populations, which are rural consumers in Africa (Ghana, Nigeria, Rwanda, Uganda and Zambia), Asia (India) and Latin America (Guatemala). As part of these studies, the impact of several potential demand side mechanisms, or levers, on consumers’ acceptance of biofortified foods were tested. These mechanisms included nutrition information and the media through which such information is conveyed, the length and content of nutrition information, different branding options, the nature (national or international) of the branding or certification agency that is endorsing the biofortified food, and the nature (national or international) of the agency that is delivering the biofortified food, among others. Overall these studies yield useful information for both product development and demand creation activities. The aims of this paper are twofold. The first aim is to present the interdisciplinary methodology behind HarvestPlus’s research portfolio on consumer acceptance of biofortified foods from food science and economics perspectives. The second aim is to summarize the key findings of these studies, while highlighting commonalities and differences across countries and crops. Such a synthesis is expected to inform both supply side (i.e., product development) and demand side (consumer awareness and marketing campaigns) efforts to maximize the consumption of biofortified foods to improve micronutrient deficiency status among target populations. The distinguishing characteristic of this paper is that all the studies reviewed here have integrated across both food science and economics approaches, thereby enriching the understanding of consumer acceptance of novel foods. The rest of the paper unfolds as follows. The next section presents the interdisciplinary methodology developed to obtain a comprehensive picture of consumer acceptance of biofortified foods. The following section presents the results of the various consumer acceptance studies conducted on several biofortified crops among target populations of several developing countries. The final section concludes with recommendations for crop development and demand creation activities, and also for future research on consumer acceptance of biofortified foods. Interdisciplinary research methods are used to shed better light on the consumer acceptance of food products of biofortified crops and on the factors that affect this acceptance. Sensory evaluation and hedonic testing are two key methods used in the food science literature, while preference elicitation or willingness to pay (WTP) methods are typically used in the economics literature. Table 1 summarizes the key aspects of each of these methods, and the details of each method are discussed in the subsequent subsections. Difference tests, ranking, grading and scales. Perceived sensory attributes such as appearance, odor, taste or texture. Price consumer is willing pay for a product. It should be noted that prior to the implementation of any such consumer acceptance study, ethical issues are considered as the research involves human subjects. Each study should be approved by appropriate research ethics review committees of both the study country and of institution(s) of the principal investigators. Sensory evaluation is a scientific method used to evoke, measure, analyze and interpret human responses to food products as perceived through the senses of sight, touch, odor, taste and sound (Meilgaard et al. 2006; Tomlins et al. 2007). Conducted with trained panelists in food laboratories, this method captures information on whether or not or how the food products tested differ, characteristics of the food products and how these characteristics are perceived by the panelists for each product tested. This method attempts to isolate the sensory properties of food (from other – potentially bias inducing - factors such as brand entity or information about each product) to provide important information to product developers, food scientists and market researchers about the sensory characteristics. Steps involved in sensory evaluation include the selection of panelists, training according to appropriate methods, evaluation of the product and finally analysis and interpretation. To reduce potential bias the following procedures are observed: (1) Panelists are trained and often screened in order to reduce their variability. (2) Food samples are served under controlled conditions. That is, each sample is processed /cooked in the same way and served in the same quantity at the same temperature and under the same conditions. (3) Participants (typically between 5 and 20) are either placed in booths or separated by sufficient space to ensure that judgments are their own and are not influenced by interactions with one another. (4) Samples are labelled with random numbers to avoid judgments based on labels. (5) Samples are presented in different order to each panelist in order to reduce sequence/order effects. Scientific testing methods are used such that data collected can be statistically interpreted but must be carefully selected so that the correct response is measured. This can involve the use of discrimination testing (e.g., how do the two or more food products tested differ), descriptive profiling (what are the characteristics of the products tested) and sensory profiling of descriptors (use of scales to rate each characteristics according to the panelist’s perception). Statistical methods are usually applied to analyze the results and draw conclusions about both the behavior of the panel and more importantly the test products. Hedonic testing, or consumer testing, differ from sensory evaluation in that it seeks to measure the personal response (liking, preference or acceptance) of consumers (current or potential) of a product, a product idea or specific product characteristics (Meilgaard et al. 2006; Tomlins et al. 2007). Hedonic testing referred to here should not be confused with ‘hedonic analysis’ in economics which is used in a different context and application. Hedonic tests measure liking, often alongside other information that could explain consumers’ reasons for liking, such as their past purchasing habits and various demographic information (e.g., age, income, employment, ethnic background etc.). Hedonic test designs need to be carefully tailored to the expected consumer group and the objectives of the study. The most effective tests for preference are based on carefully designed protocols applied to selected consumers using representative products. As cost is an important issue in hedonic testing, selected consumers need to be representative of the population of focus (in this case to target the most vulnerable populations to micronutrient deficiency) and hence the sample size should be large enough to draw a conclusion for the population. Typically this is 60 consumers or greater (ISO 8587:2006 Sensory analysis -- Methodology – Ranking). Consumers may also be selected according to consumption of the product, age, gender, income, geographic location or ethnic group. The testing methods commonly used in hedonic testing include difference tests (which determine which product is preferred over another), measures of acceptance or liking using a liking/hedonic scale. The expected outcome of the hedonic test will often define the way the test is conducted; for example, is the experiment exploring whether consumers can detect a difference in liking or is the experiment seeking to measure the intensity of liking. Similar to the sensory evaluation method, hedonic testing attempts to control for various factors that may bias consumers’ preference or acceptance, such as the way in which the food products are prepared and served, order of testing and the influence of location, family, friends and colleagues. These external factors are at controlled testing locations, which can be a food laboratory (as in sensory evaluation), a central location or home of the consumer. In this context, although low cost, a laboratory setting is often not preferred as it is disadvantageous in that it doesn’t represent the usual setting where food products are consumed. Central locations involve testing food products in places where consumers congregate or are assembled. The advantages are: the method is low cost, the environment may be a place more familiar to the consumer, the presentation of products can be controlled and the method is rapid. The disadvantages are: normal use and preparation may not be tested, the questionnaire needs to be short, and repeat testing with a consumer may be difficult. Home use testing, on the other hand, although most expensive, has the advantage that the product is prepared and consumed in the home under normal conditions, using household-recipes and without the presence of the researcher. It can also be used to assess if preferences remain stable over time, once the novelty value of the product has worn off. The disadvantage of home use testing is that there is little control over how the product is used. Experimental auctions (such as nth price auctions), auction-like mechanisms (such as Becker-DeGroot-Marschak mechanism [BDM]) and revealed choice experiments are the most commonly used economic valuation methods for estimating consumer willingness to pay (WTP) for novel goods (see e.g., Lusk and Schroeder 2006; Lusk and Shogren 2007; Corrigan et al. 2009). These methods have been extensively used in the ex ante evaluation of consumer preferences (measured in terms of their WTP a price premium or willingness to accept a price discount) for new food products (see e.g., Lusk et al. 2001; Alfnes and Rickertsen 2003; De Groote et al. 2011). In experimental auctions and auction-like mechanisms, real (food) products are offered for sale and participants expend real money to purchase them. There are several such mechanisms: for example, in an nth price auction, participants simultaneously submit sealed bids for the product(s) and the n-1 highest bidders pay the nth highest bid as the price for the product (Lusk and Shogren 2007). In contrast, in the BDM auction, an individual’s bid is compared to a “bid” that is randomly drawn from a distribution by the enumerator. If the respondent’s bid is lower than the randomly drawn on, she does not win; while if it is higher, she wins the good and pays the lower (randomly drawn) price. These and other auction elicitation mechanisms are designed to induce respondents to truthfully reveal their values for the product under consideration. An alternative class of elicitation techniques is revealed choice experiments, where two or more goods are usually displayed along with pre-determined prices, and participants are asked to choose the one they would prefer to purchase: bids are thus not directly elicited, but willingness to pay is inferred from choices made by consumers. The setting of a revealed choice experience is thus similar to that in a supermarket. The theoretical basis of revealed choice experiments is based on the random utility theory (McFadden 1974), where consumers’ decisions are based not only on the good as a whole, but also on its characteristics (in the case of food, on its taste, aroma and so on). Given different alternatives, consumers chose the product, which provides them with the greatest utility. These revealed choice experiments can capture tradeoffs between prices and characteristics for example. An econometric exercise (using multinomial, mixed or nested-logit classes of models) can estimate WTP from the choices that consumers make. Harrison et al. (2004) and List (2003, 2011) coined these types of revealed preference experimental settings (such as revealed choice experiments, experimental auctions and auction-like mechanisms) as framed field experiments when the methods are adapted to real markets, thus distinguishing them from laboratory experiments (which often use students as subjects). The studies reviewed here were all conducted with (mostly rural) consumers in developing countries who make purchase decisions. In addition to assessing sensitivity of choice of method – both across food science and economics, and within economics, the designs incorporate several interesting features, such as varying the amount of participation fees (to see if higher participation fees result in inflated WTP); distinguishing between hypothetical and real scenarios; and considering the impact of nutrition information, and the method by which it is communicated, on WTP. This is demonstrated in Table 1, which shows various treatments applied in the experimental designs of studies included in this review. In this section we summarize the results of the sensory evaluation studies conducted with expert panels, and hedonic testing and WTP studies, all of which were conducted in rural areas, with high prevalence of micronutrient malnutrition or poverty, and where there was substantial production of the staple crop under consideration. Hedonic testing and WTP data were often collected from the same respondents as part of same experiment. Therefore these studies are introduced in a summary table (Table 2) below, and the key results of these studies are summarized in the subsequent subsections following the summary of the results of sensory evaluation studies. Comprehensive sensory evaluation studies were conducted with trained expert panels for OSP in Uganda, vitamin A maize in Zambia and Ghana, and iron bean varieties in Rwanda. For all of the products, the expert panelists were able to differentiate between the biofortified and non-biofortified samples presented with respect to appearance, taste, odor and texture. The relationship between the sensory attributes of the products and the visibility of the nutrition traits was clearly linked. In the case of crops with a visible nutrient trait (i.e., sweet potato in Tanzania and Uganda, and maize in Zambia and Ghana) the orange color of beta-carotene and other carotenoids was a clear determinant in differentiating low and high carotenoid varieties (Tomlins et al. 2014a, b, c; 2012). In fact, the presence of the carotenoids not only resulted in changes in color of the products but also changes in texture, odor and taste (Tomlins et al. 2012). This latter result was especially true for sweet potato where high carotenoid containing varieties tend to have lower dry matter content. Hence, in the models for the sensory attributes, sweet taste, crumbly texture and watery texture were correlated with the dry matter content of sweet potato. Concerning the logarithm of the carotenoid content, regression models indicated high correlations with odor attributes, orange and white color, and taste. The variation of the carotenoid content of sweet potato is clearly linked with changes in the dry matter content and a wide range of sensory attributes that relate to the entire sensory spectrum (odor, appearance, taste and texture). It is speculated that, in plants, carotenoids not only influence the light absorption properties, and hence color, but have a wider role. Their chemical and physical properties are strongly influenced by other molecules in their vicinity, especially proteins and membrane lipids. In sweet potato, a genetic correlation between high beta-carotene accumulation and low dry matter (low starch) content suggests relationships with textural changes. The clear sensory differences due to the carotenoid content are expected to lead to clear branding of the products during marketing and promotion. In the instance of iron beans consumed in Rwanda (Tomlins et al. working paper in progress), while there were substantial sensory differences between different varieties of beans with respect to appearance, texture, odor and taste, these were not related to the iron content. This relationship was empirical through sensory testing. Therefore, it is unlikely that consumers will be able to differentiate beans of differing iron levels by sensory factors alone. However, where a high iron bean has clear visual traits (appearance, shape or size), these could be used to brand that variety. In each of the studies summarized in Table 2, consumers were asked to test two to four food products, one of them being the control food product prepared with a local/conventional crop variety (or varieties), and the other(s) being food made with a variety (or varieties) of biofortified crops. In each case consumers were asked to rate various attributes of these foods according to a scale (ranging from 1 to 5, 7 or 9, with 1 being dislike very much and the highest number being like very much). The differences in ranges were often due to challenges in translating a nine-point hedonic scale in English to other languages as well as the challenges in working with people who have varying levels of education. In some cases, for example when testing preferences of children, age factors needed to be considered (Tomlins et al. 2007, 2014b). Attributes evaluated differed across crops, but mainly included those pertaining to taste, appearance (such as color), texture, size and aroma of the food. For home use testing, attributes related to cooking and overnight keeping were also evaluated. In each study, a group of consumers (control group) answered hedonic testing questions without any knowledge of the nutritional benefits of the food made with biofortified varieties, whereas consumers in treatment groups tested the food products and stated their hedonic ratings following the information treatment they were assigned to. Across studies information treatments emulated potential demand creation campaigns, stating the nutritional benefits of the biofortified crop varieties and explaining how their regular consumption could improve the participants’ and their household members’ health outcomes. The target level of acceptance varied according the testing methods. In hedonic testing, the target level was usually set at levels above ‘neither like nor dislike’ as the scales did vary in number of categories from one experiment to another. As staple crops are consumed frequently and in large quantities, consumers may be sensitive to even the smallest changes in the consumption attributes of these crops. However, overall, for all crops, consumers rated all varieties (biofortified and conventional) high with almost all consumers stating above average liking scores, even in the control groups. For the control products, this could be attributed to the fact that in the majority of these studies the control varieties used were those that were popular in the study locations (with the exception of maize experiments where both local white and local yellow varieties were used in Zambia [Meenakshi et al. 2012] and Ghana [Banerji et al. 2013], and in most African countries white maize is preferred and yellow maize is associated with food aid and livestock feed). For the biofortified products, this is very good news, and reveals that the other methods used while breeding these varieties (such as participatory varietal selection) have successfully incorporated farmer (as consumers of planting material) preferences for consumption traits. Another result, which is almost uniform across studies, is that once the consumers find out about the nutritional benefits of biofortified varieties, their liking of biofortified products increases, while their liking for the conventional product decreases. It should be noted, that the hedonic testing also sought to categorize the populations into different sub-groups within the population. A feature of this is that where rural and urban groups were compared (for example for OSP), for rural groups, where OSP was a staple, consumers had a higher preference for all varieties regardless of appearance whereas in urban areas, where OSP is not a staple to the same extent, preferences were more mixed. Crops with visible nutrition traits: as explained above these are vitamin A enriched crops which change color due to increase in beta carotene content. These crops include OSP which is orange in color rather than commonly consumed white/cream in study countries; vitamin A maize which is orange in color rather than commonly consumed white maize in southern Africa and white/yellow maize in eastern/central Africa, and vitamin A cassava which is yellow in color rather than commonly consumed white cassava products in some parts of Nigeria and yellow (due to mixing with palm oil) cassava products consumed in other parts of Nigeria. Whether or not consumers like and accept this change in color (and other associated changes, such as aroma, as found in sensory evaluation studies explained above) should be understood for informing consumer awareness and branding campaigns. Crops with invisible nutrition traits: as also explained above, these are crops enriched with minerals, such as iron beans and iron pearl millet. These biofortified crops do not change color, however, whether or not other consumption attributes are effected by biofortification, as well as the consequences of not being able to differentiate this product in the market should be investigated. The summary results are presented in Table 3. Overall for crops with visible nutrition traits, the hedonic testing findings reveal that even in the absence of information about the nutritional benefits of food made with biofortified varieties, consumers in general do not dislike these varieties. In some cases, such as OSP in Uganda (Chowdhury et al. 2011), orange maize in Zambia (Meenakshi et al. 2012) and in some districts in Ghana (Banerji et al. 2013), and yellow cassava in Oyo State of Nigeria (Oparinde et al. 2014), consumers like the sensory attributes of food made with vitamin A enriched varieties as much as, if not more than, food made with conventional ones. When information about the health benefits of vitamin A enriched biofortified varieties are given, however, consumers’ overall ratings of food made with biofortified varieties often exceed those of food made with conventional varieties in all but one case (one of the yellow cassava varieties in Imo State of Nigeria). In Zambia, the media through which the information was delivered didn’t have an effect on hedonic scores, however, a longer exposure through home-use-testing did show an effect on hedonic scores (Meenakshi et al. 2012). In Nigeria the nature of the authority, which delivered the yellow cassava planting material (i.e., international vs federal authority), didn’t have an effect on hedonic scores. (a) In Imo State, 23 % of participants liked light yellow as much as local, 24 % liked it more than local while 53 % did not like it as much as local. Also, in Imo State, 29 % of participants liked deep yellow as much as local, 31 % liked it more than local while 41 % did not like it as much as local. (b) In Oyo State, 14 % of participants liked light yellow as much as local, 65 % liked it more than local while 21 % did not like it as much as local. Also, in Oyo State, 12 % of participants liked deep yellow as much as local, 57 % liked it more than local while 31 % did not like it as much as local. For invisible trait crops, that is iron bean and iron pearl millet, the evidence is also mixed. In India, even in the absence of information, consumers like the attributes of iron pearl millet as much as, if not more than, those of the local pearl millet variety (Banerji et al. 2015). The nature of the brand and certifying authority (i.e., international or state level) for iron pearl millet didn’t have any significant impact on consumers’ hedonic scores for these varieties. For beans in Rwanda (Oparinde et al. 2015), preliminary results reveal that there are significant differences in the consumer rating of different iron bean varieties. Some of the iron varieties are systematically preferred over other iron bean and conventional varieties. Even the presence of information about the nutritional benefits of all iron bean varieties and longer exposure to iron bean varieties through home use testing did not reverse consumer dislike of some iron bean varieties compared to other iron and conventional varieties. Preliminary results from Guatemala (Perez et al. 2014) reveal that, even in the absence of information, consumers rated key consumption attributes of the iron variety as high as if not higher than those of the conventional variety. Information about the nutritional benefits of the iron bean variety increased consumers’ overall liking of this variety compared to the conventional one. The results of the various WTP studies are also summarized in Table 3. For crops with visible traits, even in the absence of information, consumers are willing to pay for food products made with biofortified varieties as much as (e.g., OSP in Uganda and vitamin A maize in Zambia), if not more than (e.g., vitamin A cassava in Oyo state, Nigeria) food products made with conventional varieties of these crops. Across all studies for vitamin A crops, nutrition information results in consumers willing to pay a significant price premium for biofortified food products compared to conventional food products, ranging from 8 % to as high as 50 %, depending on the study. Therefore information campaigns are needed to drive the demand for vitamin A enriched varieties, though the need for these campaigns vary from not so imperative (in the case of one of the vitamin A cassava varieties in Oyo State in Nigeria) to critical (in the case of vitamin A maize in Ghana which fetches a high discount in the absence of information). For crops with invisible nutrition traits the results are mixed. For iron pearl millet, consumers are willing to pay a price premium of about 6 % - even in the absence of information about its nutritional benefits - over conventional pearl millet. This premium increases five fold with the presence of information. In Guatemala, preliminary results show that consumer WTP doesn’t significantly differ between the two bean types (iron bean and conventional bean) even in the presence of information about the superior nutritional benefits of the former. Finally, preliminary results from Rwanda reveal that one of the iron bean varieties is preferred to both local and the other iron bean variety, even in the absence of information. In that country several information campaigns are tested, and none of them could reverse the discount associated with this latter iron bean variety, which is not liked due to its various consumption attributes, such as overnight keeping quality. This result reveals that, even if consumers do value nutritional benefits, they are not willing to trade off nutrition attribute with other consumption attributes they value highly. Across these studies several aspects of nutrition information, given through simulated consumer awareness campaigns, were tested. In Zambia two sources of media were tested to convey the nutrition message (simulated radio messaging and community leaders). Consumers who received the information through radio and those who received it from community leaders showed similar WTP values, implying that radio messaging, which is significantly less costly than face-to-face message delivery, can be used to convey the nutrition information. In Rwanda several aspects of messaging and information campaigns were tested, including the length of the message (succinct/short messages vs. detailed/long messages), frequency of hearing the message (once vs. thrice) as well as the way in which the message is framed (a positive message highlighting the health benefits of having sufficient iron in one’s diet vs. a negative message highlighting the health costs of not having sufficient iron in one’s diet). The preliminary results reveal that the length of the information doesn’t have a significant effect on WTP – therefore short messages are just as effective as longer ones, and should be preferred due to their potential lower costs (e.g., air time for radio or TV commercials). Similarly, negative (scare) messages were just as effective as positive (motivate or aspire) messages. Finally in both Rwanda and Guatemala, preliminary results reveal that a higher frequency of having heard the nutrition message (once vs. thrice) has a significant but very small effect. This result, in conjunction with the one on message length reveal that extensive consumer awareness campaigns (shorter messages given fewer times) covering more consumers could be more cost-effective that intensive consumer awareness campaigns (longer messages given several times) reaching fewer potential consumers. In addition to the nutrition messages and consumer awareness campaigns, other aspects of delivery and marketing strategies were tested. In Nigeria there are no well-developed seed systems for cassava planting material and new material is usually introduced through national or international public institutions or NGOs. In order to understand what kind of a delivery agent would maximize farmer adoption (and hence consumer acceptance) of biofortified cassava varieties, two types of delivery authorities were tested: a Federal (national) delivery authority and an international delivery authority. Consumers in Imo State were indifferent to the authority delivering the biofortified planting material, whereas Oyo State consumers preferred delivery by the international authority. These results have implications for the development of partnerships for successful and sustainable delivery efforts. For crops with invisible traits, mechanisms are needed to differentiate them in the market. In India two types of brands and certification authorities were tested: international brand and international health agency certifying the iron content of the iron pearl millet vs. local brand and state level health authority doing the certification. The results revealed that consumers – especially women consumers - preferred international branding and international certification authority to their state level counterparts. As women are the main decision makers in the households when it comes to feeding the family, certification, branding and promotion of iron pearl millet varieties through international agencies could result in higher adoption and consumption rates. Finally, in Rwanda the effect of endorsement of the iron bean varieties was tested. The endorsement was done by the district authority, who stated at the end of the simulated radio message that s/he approves the message. Preliminary results reveal that the effect of this endorsement on engendering demand for iron bean varieties was insignificant. This could be due to the type of the endorsing authority used. Consumers may not know or may not be familiar with the office of the district authority. Effects of other endorsement authorities (such as public figures or celebrities in health or well-being or sports field) should be tested in this and other locations. As mentioned in the introductory section above, the studies synthesized in greater detail in this paper are those led by HarvestPlus, as part of its consumer acceptance research portfolio. There are, however, other studies in the literature on consumer acceptance of nutritionally enhanced food, such as various sensory evaluation and hedonic rating studies conducted to investigate consumer acceptance of iron and/or zinc rice varieties (see e.g., Padrón et al. 2011; Garcia Montecinos et al. 2011; Vergara et al. 2011), nutritionally improved bean varieties (see e.g., Tofiño et al. 2011; Carrillo Centeno et al. 2011), and various OSP products (see e.g., Serrano Romero et al. 2011; Netto Rangel et al. 2011) in several countries in Latin America and the Caribbean. Similar sensory evaluation and hedonic rating studies have been conducted in Africa for OSP (see e.g., Laurie and van Heerden 2012) and vitamin A maize (see e.g., Muzinghi et al. 2008; Pillay et al. 2011). In addition to these sensory evaluation and hedonic testing studies, a few economics studies were conducted to evaluate consumer willingness to pay for biofortified food, such as OSP (see e.g., Naico and Lusk 2010) and vitamin A maize (see e.g., Stevens and Winter-Nelson 2008; De Groote et al. 2011) in various African countries. The majority of these studies showed that consumers liked the biofortified foods as much as if not more than their conventional counterparts (with the exception of adults reported in the studies of Garcia Montecinos et al. 2011 and Pillay et al. 2011), and a few of them investigated the impact of nutrition information and awareness campaigns on consumer acceptance and found them to have a positive effect on demand for nutritious food (Muzinghi et al. 2008; Naico and Lusk 2010). As evidence builds up on the efficacy and cost-effectiveness of biofortification as a viable strategy for alleviating micronutrient deficiencies, several stakeholders – ranging from national governments to international organizations and NGOs to seed companies - are interested in participating in efforts to scale up this nutrition intervention. As plans for scaling up biofortification firm up, information is needed on what kind of biofortified products are accepted by consumers and hence should be scaled up, and what kind of mechanisms or levers can maximize consumption (as a pull mechanism for adoption) of biofortified crops to reach nutrition impact at scale. To generate such information, in the past 8 years HarvestPlus, the global leader of biofortification, has been leading a series of consumer acceptance studies, integrating food science and economics methods. This paper summarized the methods used to conduct these studies, as well as the key findings, which will inform both crop development activities, and the implementation of marketing and delivery strategies to ensure maximum nutrition impact. Overall the studies summarized here revealed that biofortified foods are liked by target consumers, in some cases even in the absence of information about their nutritional benefits, though information and awareness campaigns often have an important role to play. Each one of these studies generated several programmatic recommendations for more effective and targeted crop development, marketing and delivery strategies. Each study has generated results that are specific to the crop-country-micronutrient combination, owing to the heterogeneity, especially in culture and individual specific preferences, which shape our food choices. Therefore it is important to conduct these studies for each crop-country-micronutrient combination so as to be able to generate relevant information for the success of development, delivery and marketing of biofortified foods. In addition to their context specific implications for crop development, marketing and delivery activities, these studies have also extended the frontier in consumer acceptance literature in several ways, including: investigation of the impact of cheap talk (i.e., telling respondents to treat hypothetical scenarios as if they are real) on reducing hypothetical bias (Chowdhury et al. 2011); comparison of different preference elicitation mechanisms, including experimental auctions, auction like mechanisms and revealed choice experiments (Banerji et al. 2013); comparison of WTP values resulting from within and between subject elicitation methods (Banerji et al. 2013, unpublished project report); comparison of results from home-use-testing and central location testing studies (Meenakshi et al. 2012); and investigation of the impact of study participation fees (Banerji et al. 2013) and elimination of such participation fees (Oparinde et al. 2014 and 2015). All of these investigations have resulted in useful recommendations for improving the data quality, study design and methodology of the subsequent studies. There are several areas for further research. These include but are not limited to: research on the duration of exposure and branding on acceptance in the longer term; the impact of competing products; and wider issues such as the effects of longer term promotion. Similarly, a greater understanding of how the drivers of acceptance of invisible traits differ from that of visible traits is necessary. On the methodological side, while our results suggest that findings are broadly robust to choice of elicitation mechanism, there is need for more methodological work on how loss aversion considerations may affect the design of such experiments. As several stakeholders are interested in introducing biofortified foods in their countries, there will be opportunities for applying these further research ideas in new settings, and thereby for adding to this small but growing literature. See for example van Jaarsveld et al. (2005) and Low et al. (2007) for vitamin A OSP; Moura et al. (2014) for vitamin A maize; Moura et al. (2014) for vitamin A cassava; Beer et al. (2014), Haas et al. (2013) and Pompano et al. (2013) for iron pearl millet, and Haas et al. (2011; 2013) and Luna et al. (2012) for iron beans. See Hotz et al. (2012a) and Hotz et al. (2012b).